Barry Blanchard Returns To Ice Fest! Michigan Ice Fest is proud to announce that our good friend Barry Blanchard will be joining us again (use Canadian accent when saying “again”). We have our Gold Level Sponsor Patagonia to thank for sending Barry to this years event! Barry Blanchard is known world wide as the modern father of Canadian alpine mountaineering and hard ice climbs. Often described as the “Bonatti of the Rockies,” and Canada’s greatest alpinist, the Canmore-based writer and photographer spends his time romping around the globe in search of adventure on high alpine faces. Barry is an internationally certified UIAGM guide and frequently works as a safety coordinator for Hollywood. 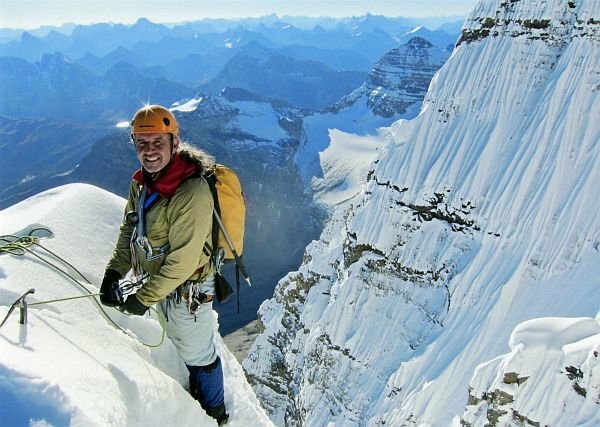 He has been featured ice climbing in the IMAX Extreme film and Vertical Limit. His exploits include the first ascent of the epic North Pillar of North Twin, first ascents in winter on the north faces of Les Droites and two successful expeditions to Mt. Everest. In 2002 he opened a new route on the Emperor Face of Mt. Robson. It was Barry’s seventh start over many years, and partners Eric Dumerac and Philippe Pellet insisted on the name Infinite Patience (VI, WI5, M5, 5.9). In addition to recent routes on the southwest face of East Kahiltna Peak, the southeast ridge of Mt. Asperity and the north face of Bravo Peak. 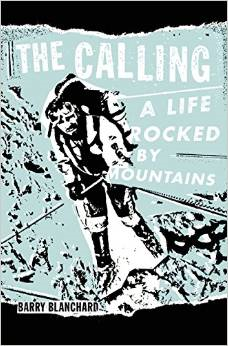 Barry is also the author of The Calling A Life Rocked by Mountains and will be available for purchase and signing! With heart-pounding descriptions of avalanches and treacherous ascents, Barry Blanchard chronicles his transformation from a poor Native American/white kid from the wrong side of the tracks to one of the most respected alpinists in the world. At thirteen, he learned to rappel when he joined the 1292 Lord Strathcone’s Horse Army Cadets. Soon kicked out for insubordination, he was already hooked on climbing and saw alpinism as a way to make his single mother proud and end his family’s cycle of poverty. He describes early climbs attempted with nothing to guide him but written trail descriptions and the cajones of youth. He slowly acquires the skills, equipment and partners necessary to tackle more and more difficult climbs, farther and farther afield: throughout the Canadian Rockies, into Alaska and the French Alps and on to Everest, Peru, and the challenging mountains in Pakistan. From each he learns lessons that only nature and extreme endeavor can teach. Gripped Magazine called his memoir, The Calling: A Life Rocked by Mountains (Patagonia, October 2014), “the most anticipated book of 2014.” The Calling is the story of the culture of climbing in the days of punk rock, spurred on by the rhythm of adrenaline and the arrogance of youth. It is also a portrait of the power of the mountains to lift us – physically, emotionally, intellectually, spiritually – and the depths of relationships based on total trust in the person at the other end of a rope. The book includes climbs with top climbers such as Kevin Doyle, Mark Twight, David Cheesmond and Ward Robinson, with killer photos and even Barry’s song playlist! Thanks again to our Gold Sponsor Patagonia for making it possible for Barry to be at this years Michigan Ice Fest!